very nice friday for me. for you, too? well, i hope so. 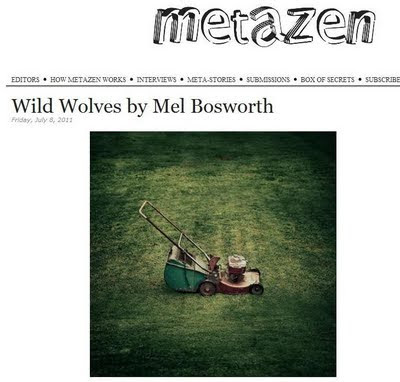 my wild wolves howled today at metazen. *update 7/9/11: The good folks at VOUCHED gave Wild Wolves some love. Sweetness. i had lunch with great people in new hampshire, one of whom is the publisher of my novel freight. "Freight is the elegant, sensitive story of a man who carries things with him. Within him. Around him. And sometimes even above him. Freight is the story of every man. Or...EveryMan. Sometimes he discards things because the burden gets too heavy or because it sickens him, and sometimes he takes on too much. But he really doesn't discard all of anything. Bits of things remain for him to haul along. Things. You know these things well. They're life. Your life." Mr. Bosworth, I just discovered you, through FictionDaily. I hope to no-god that your story "wild wolves" is fiction! If it is not,I will assume that "Mean Man" is also not fiction, because being raised by a horrid mother like you described in "wolves" could certainly turn an abused boy into a mean man. Fiction or not, you write beautifully! ha! thanks, madam. all fiction, i assure you.